Daniela Tudor and Murphy Jensen co-founded WeConnect Health in Seattle, which developed an addiction recovery app. Daniela Tudor knows how hard it is to break a habit, because she's been there. The self-described serial entrepreneur used alcohol and cocaine while working on a music industry startup earlier this decade. Trying to quit without help didn't work. "I tried everything from basically trying to control it on my own, going to yoga retreats, eating differently, changing my surroundings by moving back from Los Angeles to Seattle," Tudor said in an interview. She eventually landed at an inpatient drug and alcohol treatment center in Kirkland, Washington, for a four-week stay. That is where the idea for her next startup hit. "I journaled about it and I thought about how we can use our phones that are with us 24/7 to bridge the two things that support recovery: accountability to your care plan and connection to your support network in real time," Tudor recalled. Tudor later described her idea to another person in recovery, who just happened to be a French Open tennis doubles champion. Murphy Jensen agreed to co-found the startup WEconnect Health with Tudor in Seattle in 2015. Jensen became a beta tester for an addiction recovery app as well as executive vice president of the new company. "It's my lifeline on a daily basis," said Murphy about the now-updated technology he still has on his mobile phone. "It gives me warm, loving messages and reminders to stay on track. It keeps me connected to the key stakeholders in my life — my sponsors and mentors." WEconnect sells its software to treatment centers and insurance companies by subscription for $999 per user. Treatment providers in turn install the app on clients' phones to support and track patient recovery after discharge. This year could be a big one for the health tech startup and the adoption of mobile technology in addiction recovery. WEconnect recently signed up its first major health plan to use the platform. The Seattle company is also seeking the federal government's seal of approval to qualify the app for Medicare and Medicaid reimbursement nationally. On a related track, Tudor said WEconnect is starting third party independent testing of its addiction relapse prevention software through a clinical trial this year. 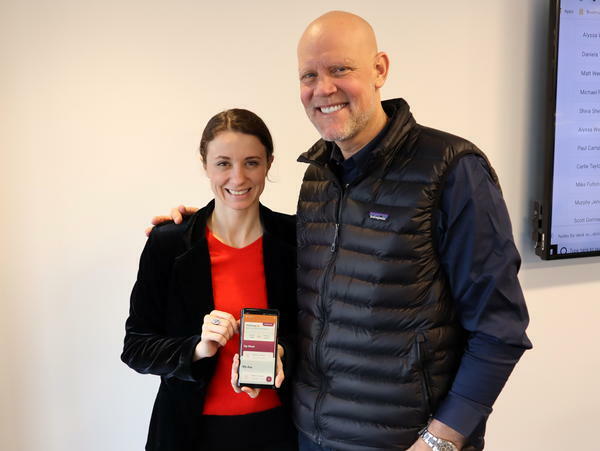 The Seattle company's product is just one of more than a dozen different smartphone apps built for addiction recovery. There are simple, free tools like a 12-step meeting finder or a sobriety counter that tracks days of clean and sober living. And then there are highly engineered computer programs that include a panic button or sound a warning if a person goes near risky locations such as their neighborhood bar. WEconnect Health is playing in the high end. Tudor pulled out her smartphone to show a reward feature that she said is proving effective in preventing relapses. The phone screen informed her that she had five days left to earn a $20 Amazon gift card by checking in to five "support routines" and 13 "self-care routines." The location-tracking ability of smartphones can confirm if patients are attending scheduled doctor and court appointments, 12-step meetings or urinalysis tests. If the client shows signs of backsliding, the software automatically sends an alert to the treatment provider and any other supporters the patient pre-selects. 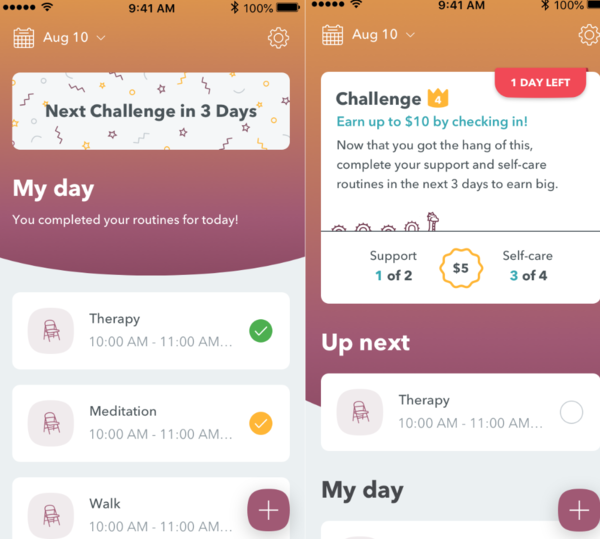 Dennis Donovan, professor emeritus at the University of Washington's psychiatry and behavioral sciences department, said few of the many available addiction recovery apps have been independently tested for efficacy. However, he foresees situations where they may be very useful. "Apps like this can provide an opportunity to develop social support networks," Donovan said in an interview. "Many people may find it difficult, or they don't choose to attend things like Alcoholics Anonymous, Narcotics Anonymous, Cocaine Anonymous and so on, but can benefit from a social system that can enhance and provide support for their recovery process." WEconnect Health CEO Tudor said her goal is not to replace human counselors. It's to cut the relapse rate in half. "In this field, the incredible thing is that even moving the needle by five percent on the recovery rate means millions of lives," Tudor said. "It means billions of dollars in cost savings." Jensen, WEconnect co-founder, knows from personal experience that the relapse rate for people in recovery is shockingly high — variously estimated between 60 and 80 percent. While on the pro tennis tour in the mid-1990s, a therapist recognized Jensen had drug and alcohol issues and referred him to an inpatient treatment center in Minnesota. "I was out within three days because my biggest fear was being found out," Jensen said. "I'd have lost my sponsorships and all my contracts and it would have affected my whole family, so I kept it a secret." Jensen said he hit bottom in 1999 at the U.S. Open and checked into treatment a second time, only to relapse around four years later. He got back on track in 2006, which was still a year before the first generation Apple iPhone hit the market. "I am so excited at the opportunity we have to give people a better chance at long term recovery," Jensen said in an interview at the WEconnect Health offices in a downtown Seattle highrise. "Currently, I'm in my thirteenth year of being clean and sober and I live a life beyond my wildest dreams."